My dad says one of his favorite Christmas memories is when, on Christmas mornings, he would read about Jesus' birth in the book of Matthew. We always did this as a family before opening our gifts, to help us focus on what Christmas is supposed to be about. David and I have continued this tradition with our own kids; but for the past 6 years we have also used The Usborne Advent Nativity Book to have a little fun as we count the days to Christmas. 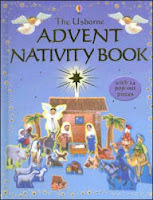 This book uses the events surrounding Jesus' birth and, for 24 days, one new cardboard figure is taken out of the book and placed on a shelf until the entire nativity scene is displayed. The story can be read each night before placing a figure, or you can choose to read it however often you like. Our kids have enjoyed having it read each night, or every other night, because their dad will often make up sound effects to go along with it. And, even though the kids are older now, it is still a fun family tradition we like to share during the days leading up to Christmas. In fact, the book has been read aloud so many times that our daughter, EL, has memorized it and can almost repeat it word for word. Elizabeth knows it so well, that on the first night last year and this year, she was able to pretty much tell the story completely by memory, even after not hearing it for 11 months!